Dynasty Warriors is a franchise that I never really played, despite the fact that there is no shortage of titles in both the mainline, as well as the many spinoff series. The last time I played a game in the franchise was back in college – literally a million years ago. I don’t remember which one it was – just that you ran around killing countless soldiers with highly flashy attacks. Though, something tells me that once you’ve played one, you’ve played them all. As it happens, this was also around the last time I played a title in the Mobile Suit Gundam franchise. It was some third-person shooter based off Gundam SEED which I would describe as OK, at best. Needless to say, neither game franchise had a particularly powerful impact on me. 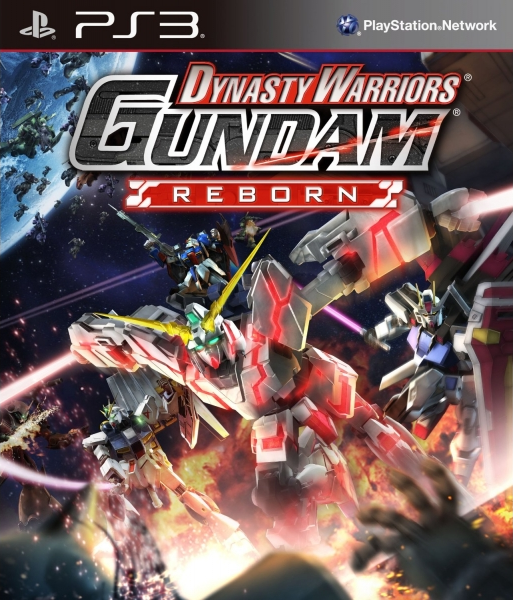 Now, however, I was given the opportunity to try out Dynasty Warriors: Gundam Reborn, the fourth entry in the spinoff series where, rather than slicing up armies of feeble soldiers, players slice up and blow away armies of feeble robots in futuristic urban and interstellar settings. So, how did my re-entry into both the Dynasty Warriors and Gundam franchises go? For anyone who has never played before (or needs a refresher), Dynasty Warriors is a hack ‘n’ slash title in which players control a single, overly powerful champion as they cut a swath through waves of soldiers that serve as little more than fodder for their sweeping and damaging attacks. Along the way, players will capture various fields by clearing them of enemy soldiers, allowing for their own forces to occupy the spaces instead. Players will also need to defend fields they have already captured, as enemy forces will constantly try to retake their territory. However, it isn’t always so simple, as the enemy has their own heroes who will provide a much greater challenge than standard soldiers. These powerful enemies will often need to be defeated before total victory can be achieved. I’d say this description fits very well with the themes of Gundam, as well. Controlling your chosen vehicle is simple, requiring only the Square and Triangle buttons to perform your basic combos. Square is your melee attack, while Triangle is your ranged attack. You can also charge ranged attacks for more damaging and far-reaching attacks. The X button is used to dash, while the O button activates your special (SP) attack – generally an incredibly powerful move that can quickly wipe out a group of enemies. 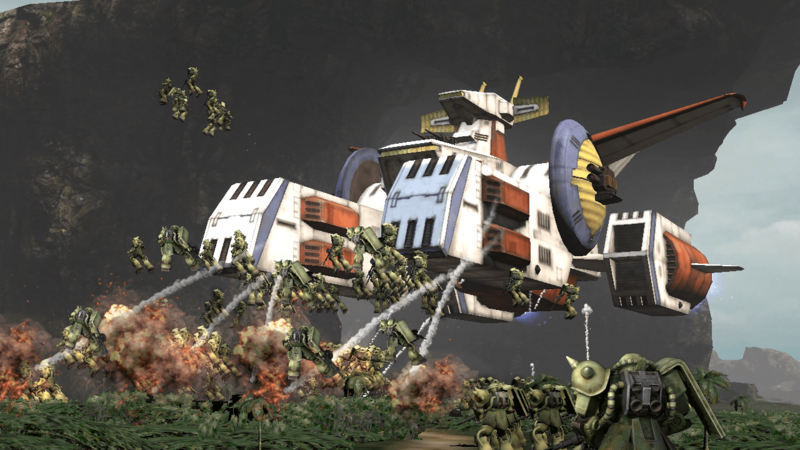 R1 allows players to “jump” into the air with their jet boosters, which allows them to reach hovering enemies, as well as weak points of opponents piloting larger mobile armors. Pushing L1 will snap the camera behind you, with the added effect of having you block against incoming attacks. Finally, pushing R2 will activate your character’s Burst Mode; a special combat state that unlocks a pilot’s hidden potential. This will have different effects depending on your pilot, but it usually comes down to increasing speed, damage or slowing down time, among others. Using your SP attack during Burst Mode will allow your chosen partner to briefly pop into the battle; delivering a one-two punch of powerful attacks. Pilots and mobile suits are also strengthened separately to allow for a lot of free combinations, but we’ll get to that a little later. 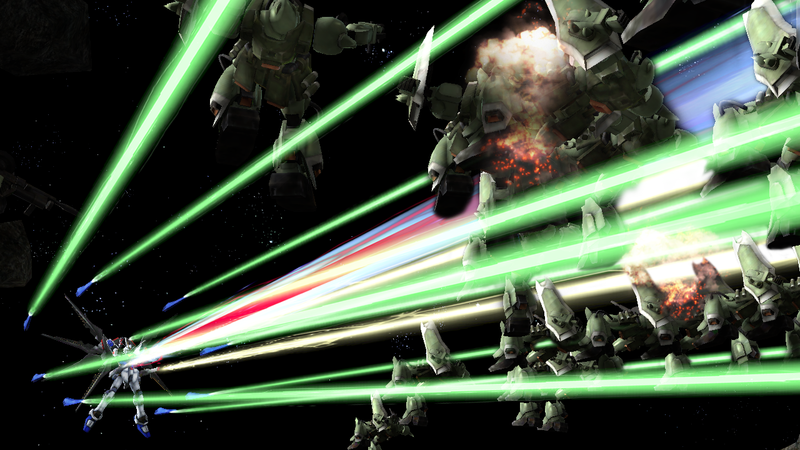 Don’t bring a Zaku to a cruiser fight. 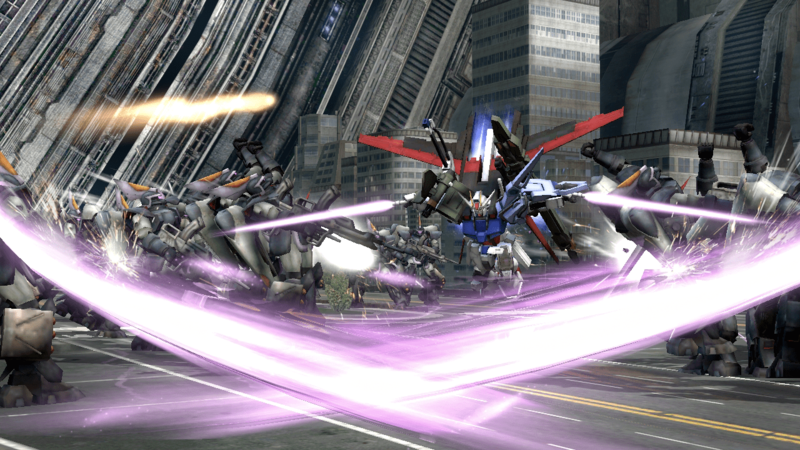 Gundam Reborn has two main game modes for players to explore: Official Mode and Ultimate Mode. I would describe Official Mode as the standard story mode of the game, but, rather than one large, overarching plot, it gives a brief summary of six storylines from various TV shows. The stories covered are the original Mobile Suit Gundam, followed by the sequel series, Zeta Gundam and the movie Char’s Counterattack. This is then succeeded by Gundam Unicorn. After that, the franchise jumps forward about 20 years to the storylines of Gundam SEED and its follow-up series, SEED Destiny. These can be played in any order, though, in the interest of cohesion, it’d be best to play them in order, as those unfamiliar with the storylines will likely be completely lost if they just picked randomly. I wouldn’t necessarily call myself a “fan” of Gundam – having only watched the Wing and SEED series back in the day – so I went into most of Official Mode almost completely uninformed. From what I could tell, the stories in Official Mode were pretty bare-bones – only covering the most significant of events – but they were still compelling enough to keep me from getting bored. Your missions follow the setpiece battles of each series, requiring you to accomplish a series of objectives during each mission along the lines of what happened in their respective shows. The problem with this, especially for someone as ignorant about these storylines as myself, is that much of the backstories are simply gleaned over, and characters can come and go extremely quickly. There were even instances when seemingly important people could be introduced and killed off during the same mission with almost no explanation. I can’t help but feel that the developers were assuming players had already watched the shows for the more minute details. Even so, while the story may be week at times, the gameplay still shines. Additionally, while you’re locked into which pilot, Gundam and partner you use your first time through an Official story, after completing it, you can replay the missions again with your choice of mobile suit. 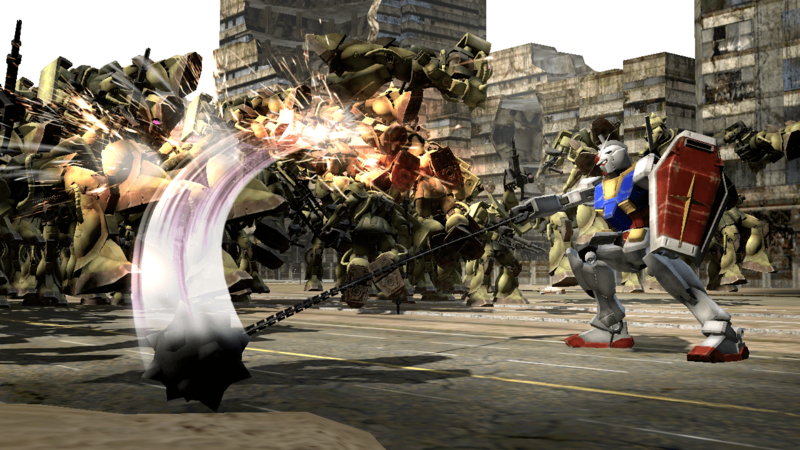 Ultimate Mode, the other main area players will explore, is another story mode, but set in a universe where travel through time and between alternate universes is apparently possible, because characters from almost every Gundam series are not only present, but also all seem to know each other. When starting up this mode, players are presented with an operation select screen. Each operation is a self-contained campaign that follows characters from different series in crossover scenarios. As you work through the missions of an operation, you will sometimes come across branching choices for which missions to tackle. Most of the time, picking one mission will lock you out of the other one, so there’s incentive to replay operations to see how differently the story might turn out. While most of the operations you play are their own separate storylines, there is something of an overarching plot present, as well. Bright Noa has gathered all the Gundam pilots from across time and space in an effort to find who among them is the greatest pilot of all. It might be flimsy, but, hey, I don’t need an excuse to blow up robots. There are also bronze, silver and gold medals that can be earned by meeting certain criteria during missions; usually by completing them in a short amount of time, defeating a certain number of enemies or playing through them with a specific mobile suit. 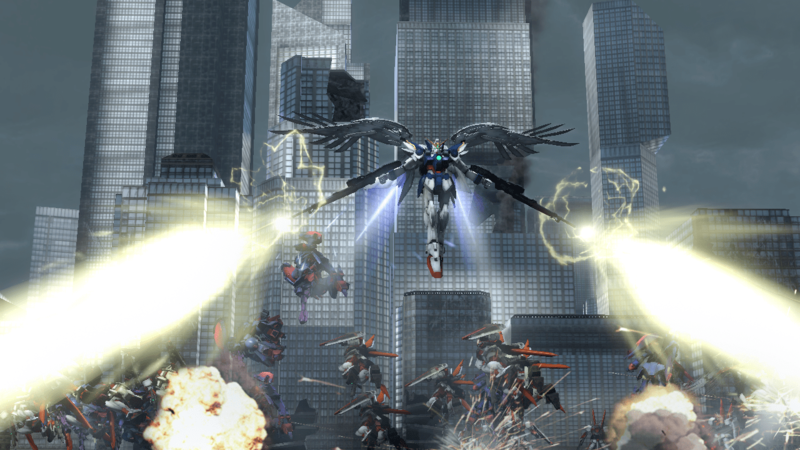 Ultimate Mode also gives a much larger degree of freedom compared to Official Mode, allowing players to use almost any pilot they wish in almost any mobile suit (when applicable), as well. The only time you are restricted in your choices is when a pilot is already present in a storyline through which you’re playing. For example, one of the earliest available operations is a storyline involving both Gundam Wing and Gundam SEED characters. Since these characters are already present in the story, they and the Gundams they pilot are already spoken for. As such, it’s usually a good idea to level up at least a few characters from different series so you’re prepared for any situation. Fortunately, if you play through all the stories in Official Mode before tackling Ultimate Mode, this shouldn’t be an issue. This not only allows you to level up multiple characters, it also unlocks many other pilots and partners upon completion. It’s especially helpful for characters like Amuro Ray of the original Gundam, who gets pretty beefy due to his presence across multiple storylines. Of course, almost everything I just said is old news to longtime fans of the series, so what does Gundam Reborn do differently compared to its predecessors? Aside from the Burst Mode and Partner Attacks that I already mentioned, locking on to enemies has been updated. It is now possible to target any important enemy, from lowly squad leaders to rival aces and mobile armors. 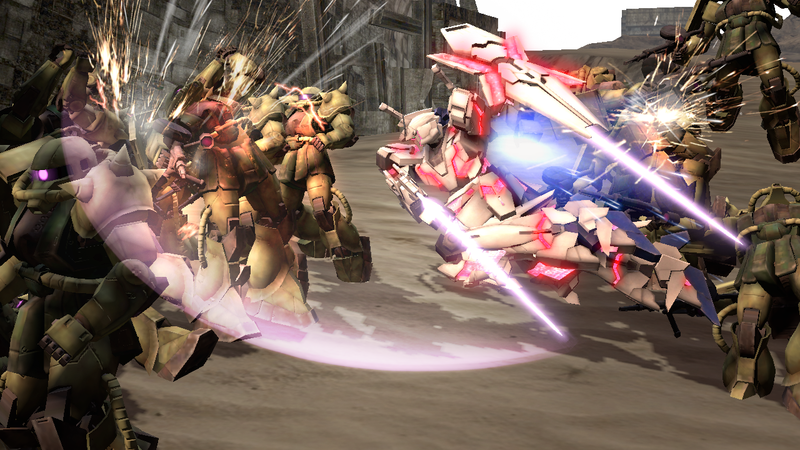 While pilots level up during missions by defeating enemies and unlock a variety of equippable skills, mobile suits are a different story. Gundam Reborn has streamlined the process of using Upgrade Plans that are obtained during missions to increase a suit’s stats by allowing players to combine multiple plans together, taking the best elements of individual layouts and merging them into even better plans. Not only that, but weapons can be upgraded separately to make them more effective, such as increasing the length of beam swords and widening the beams of laser rifles. However, only a set number of fusions and upgrades can be applied to any given plan, so some planning will need to be taken into consideration to get the most out of any mobile suit you use.